A slideshow is an image gallery that displays multiple images on one page, alternating between them in a way that highlights one image at a time. 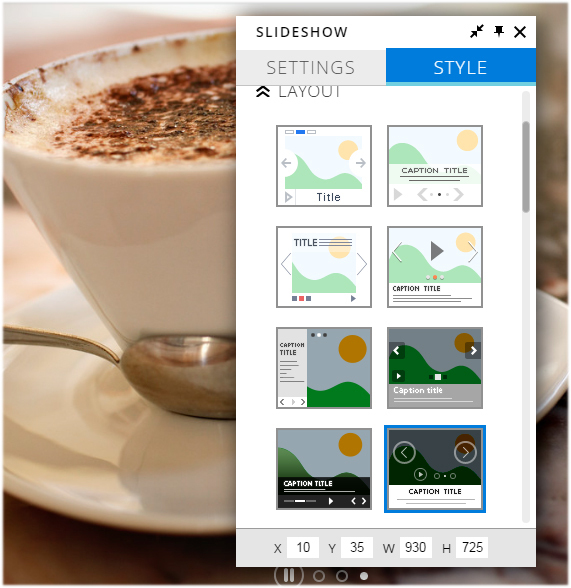 The slideshow gallery allows you to showcase your images by presenting them one at a time. In this article, we will show you how to add a slideshow image gallery using the built-in tools in your Website.com editor. 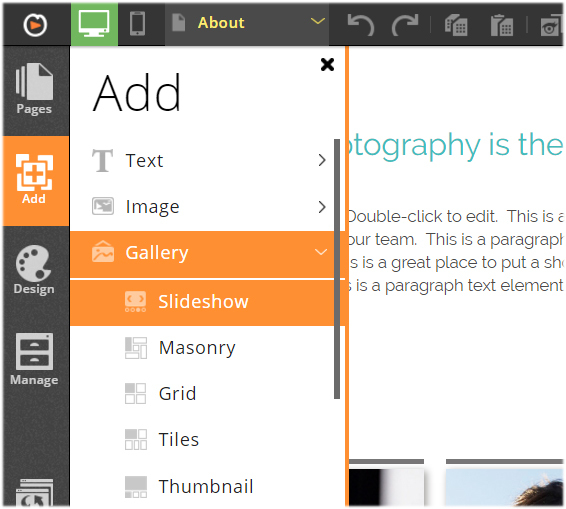 We will also show you how to customize your slideshow gallery so that it better fits your needs. 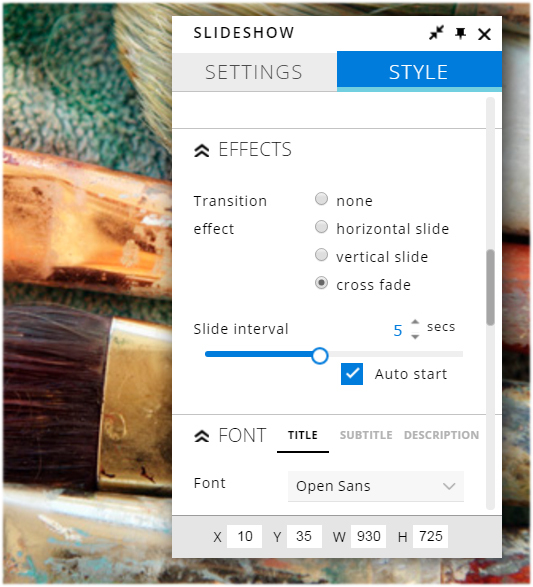 The Slideshow tool can be found on the left menu of your Website.com editor, under Add > Gallery. A slideshow is a gallery that displays multiple images on one page, alternating between them in a way that highlights one image at a time. One of the reasons for the popularity of slideshows is the lively feel the motion of the slides create – the sliding motion keeps visitors engaged and alert. Also, when showcasing images in a slideshow, you are displaying multiple images but instead of laying all the images out, they share the same space, just one after the other. This allows you to save space on your web pages. The transition of the slides (ie. the way the slideshow moves from slide to slide) is also very important, and for you also get a few choices for your slideshow. Try to pick the transition that best captures the style of the website. For example, if you have a very minimal design, you will want to go with the cross fade effect. Don’t just randomly display images one after the other, but instead, use the motion of the slideshow to tell a story about your company or use it to give a tour of your brand or products. 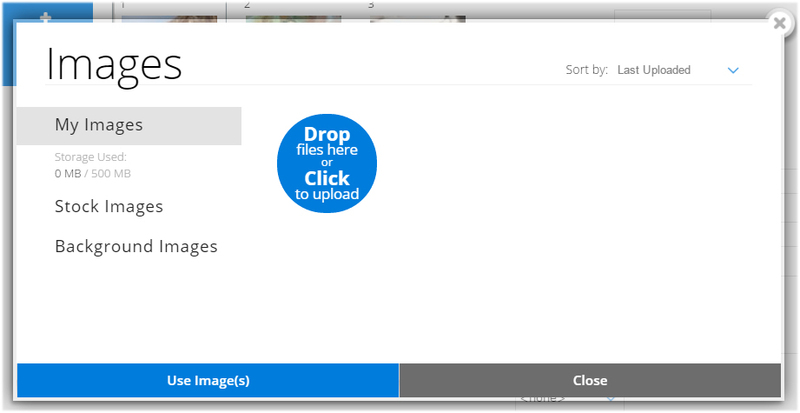 You can add your images by uploading the images from your computer. Or if you have previously uploaded an image and want to use it in the slideshow, you can find the image listed in the My Images library. You can also select a high-quality stock image from the Website.com Stock Image library. But make sure you don’t overload the slideshow. Too many images will distract your visitors’ attention and will affect the slideshow’s loading and browsing. You want to keep the numbers of images to a maximum of 5. You also want to limit the number of slideshows to one per page. Having too many slideshows on one page will become distracting and confusing. Lastly, you can easily change the images in your slideshow, you can keep the content fresh to get your visitors’ attention every time they come back to your website.